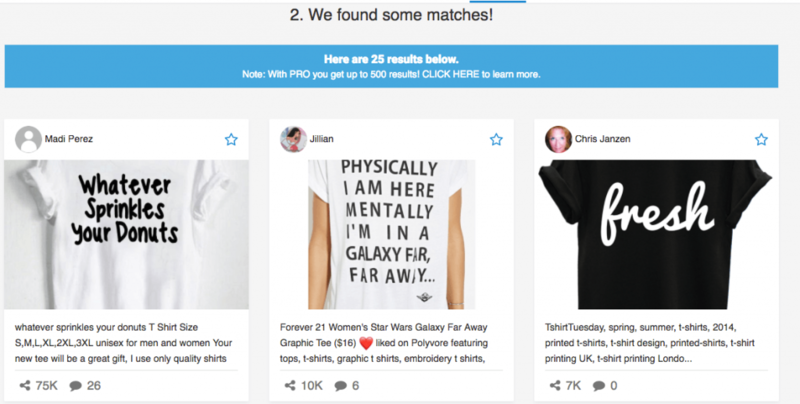 Are you already well versed hunting down trendy T-Shirt Designs on Pinterest? If not, nows the time to learn how! For newcomers, Pinterest can seem a little unusual to use. But in essence, it's an image-based social media platform where people “pin”, “repin”, share and collate photos together. It's a very creative space and with 150M+ monthly users, you can be sure it’s overflowing with inspiration for winning t-shirt designs. The visitors here are actually very commercially inclined, with 87% of users saying they discovered a product they later bought on Pinterest. With such high volume, activity and buying intent it’s a great place to buy, sell and research competitors products. 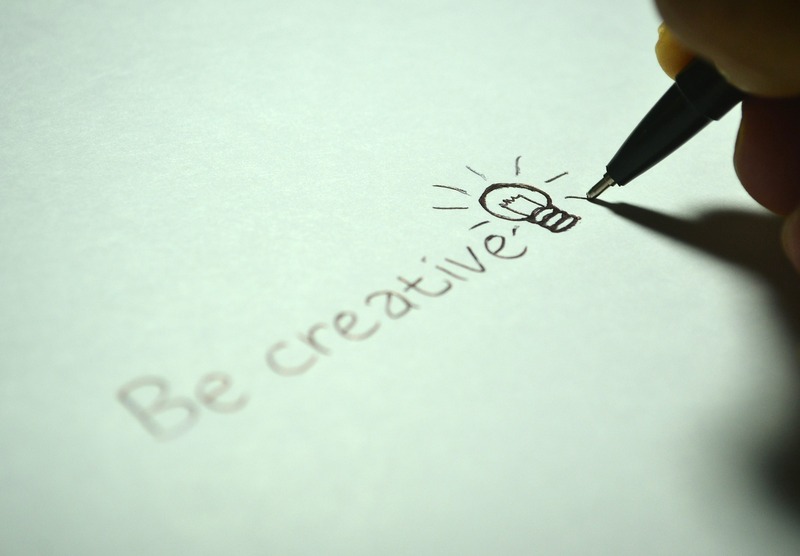 With this ever-changing and growing database of visual imagery at your disposal, you can tap into an invaluable source of creativity for t-shirt designs and branding. A picture can speak a thousand of words after all. 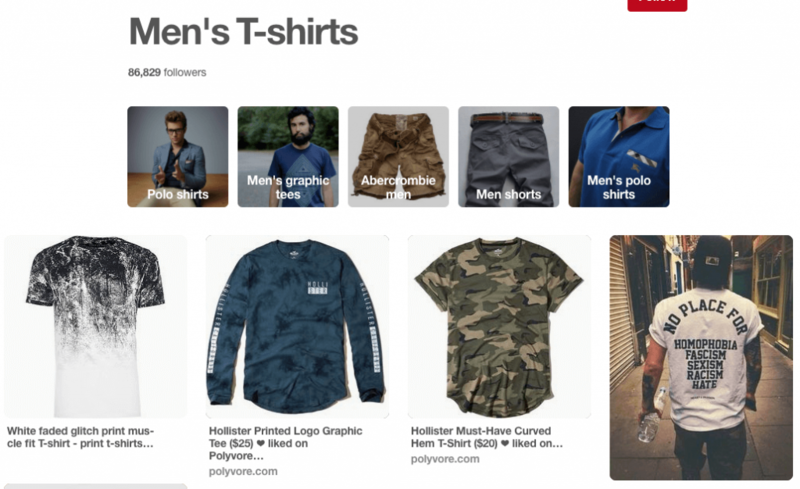 Why Use Pinterest For T-Shirt Research? Pinterest research is a visual exploration that easily branches off to take you through related imagery and products. Unlike traditional research that involves simply looking for large numbers for given search terms, it’s a more immersive experience. You'll also gather more contextual data about your audience and the presentation of the products they like to buy. Pinterest is a rich source of ideas for marketing, advertising and branding too. As you browse through images and products you are interested in, you can't help but stumble across different styles that you may not even have considered before. 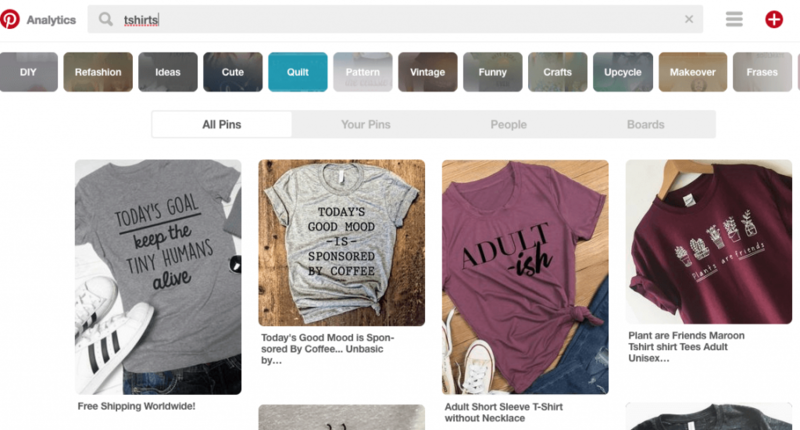 In the right hands, Pinterest is a powerful tool for seeing what’s trending and how you can get in on the action! The behavior of Pinterest users is a little different to what you might have seen on other social platforms. Typically, people will pin “idealized” images of products they like. Plus, product images feel more like photo-shoots by showing how they might be used. So instead of a simple picture of a t-shirt or a product on its own, you’ll usually see much more. This includes the person wearing it, the environment around them, props and related products. Using what you learn during this research phase can also help you build a stronger, more attractive brand and marketing campaign. You'll see many of the most creative t-shirt designers and marketers are already here. 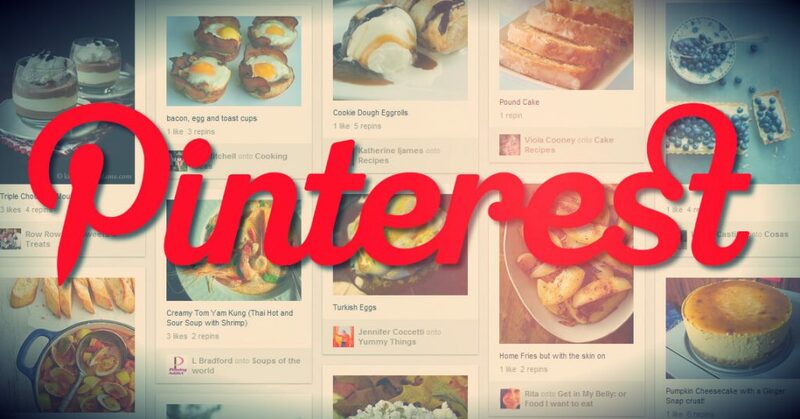 If you’ve never used Pinterest before, it won’t take you long to familiarize yourself. Primarily it works by typing a keyword into the search bar then scrolling through the related “pins” until something catches your eye. 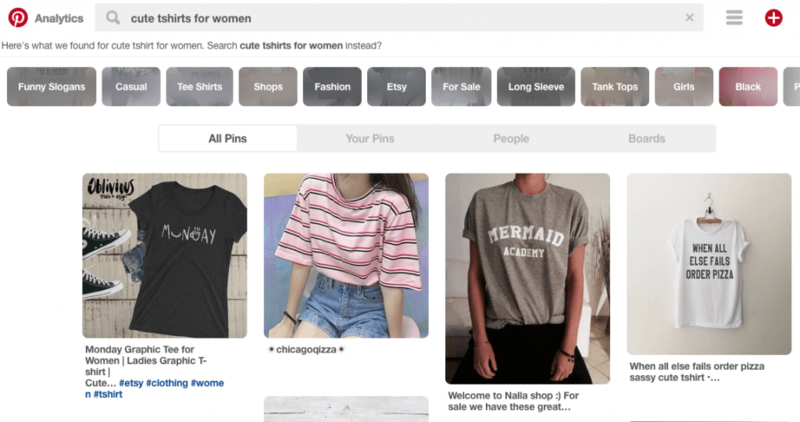 As of October 2017, Pinterest has decided not to show the repin counts on pins as you browse through your home feed, or other people’s boards or pins. Fortunately, pins are still ordered by popularity. So pins with the most likes and repins will be appearing first. However, without this data visible it can be harder to gauge a pin’s popularity at a glace. Finding out what’s popular is as simple as searching with broad keywords such as “t-shirts”. Then use the Guided Search bar below to add suggested keywords to refine your search. 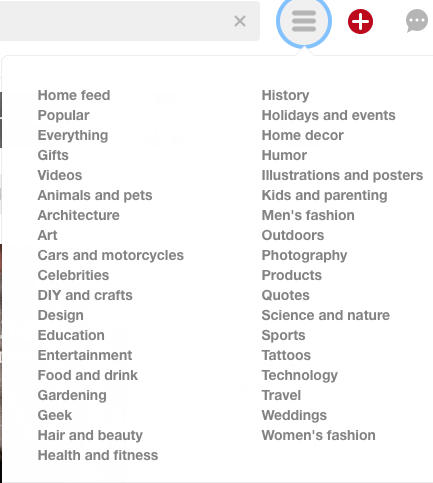 You can continue to refine your search using the guided search multiple times and Pinterest many even suggest searching for different popular terms. Remember pins are sorted by popularity, so the first results will be the most popular. Or you could add broad niche specific keywords to keep your search within your niche. For example “dog tee” or “dog tee-shirt”. Pinterest has been engineered specifically to help the explorative researcher. If you are not dead set on a chosen niche yet you can navigate using their built-in categories and suggestions. 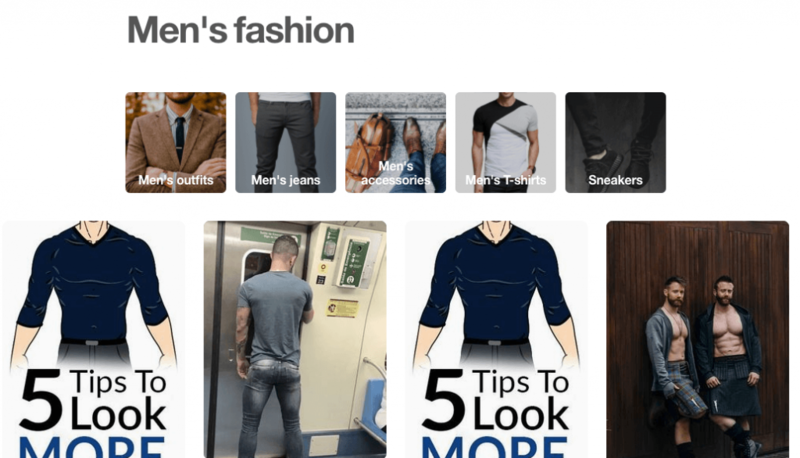 For example, clicking on “Men’s Fashion” brings you into the category and presents the most popular results. Then you can begin to refine or search or explore sub-categories by clicking on the options below. By clicking on “Men’s T-Shirts” we can gauge the popularity of the niche by seeing there are 86,829 followers. Then we can continue to drill down into “Graphic Tees” if we wish too. You may even be able to find a niche specific category to start, then try to refine down to t-shirts. Or lastly, you may choose to start really high-level and explore down by simply using the “Popular” category. The true beauty of using the Pinterest platform is the ability to match with similar products. This can be invaluable for coming up with new variations or ideas you might not have thought of before. Related Products Lists – Once you have searched through using keywords and found a pin you like, click on it. When you scroll down you will see a whole list of related pins. Visually Similar Results – If you click the icon in the top right corner of the image, you’ll be presented with the most visually similar results. Then you can use the guided search bar to hone in on different aspects. Pinterest Boards – If you enjoy broad searching, you might want try diving into Pinterest Boards. Look up a broad keyword like you normally would then select “Boards” from the top menu. You’ll be presented with a selection of human-curated boards relating to your keyword. Since they usually revolve around a single-niche or product, it’s a great resource for new designs. As we mentioned earlier, Pinterest has removed all like and repin information visibility from their platform. Now all we have to rely on the fact we know results are being displayed by popularity. However, it still leaves us with some uncertainties and makes it difficult to compare different ideas. We’re a fan of hard numbers, facts and figures to for certainty of profitable designs. That’s why we use Sorting Social in combination with Pinterest for confidence in our research. It’s really easy to use and can be tested out for free. Just pop in your niche and search as you normally would using Pinterest. You see that the most popular posts are sorted to the top, but you’ll actually have the number of shares and comments indicated too. We recommend exploring using Pinterest first using the above techniques, then throwing your best keywords and phrases into Sorting Social to measure popularity. 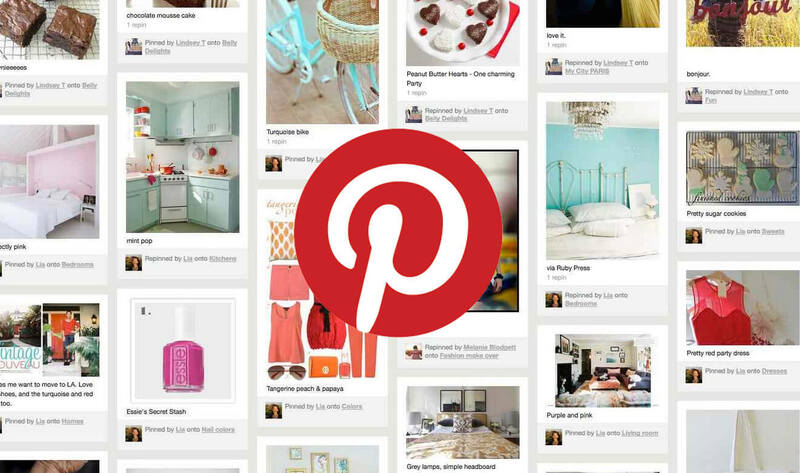 Pinterest has become somewhat of a gold-mine for discovering new products to sell online. It's especially lucrative for fashion brands, t-shirts and apparel sellers. Explore first using Pinterest, then measure your findings using Sorting Social to validate them. You'll have a handful of trendy designs and plenty of branding inspiration in no time! 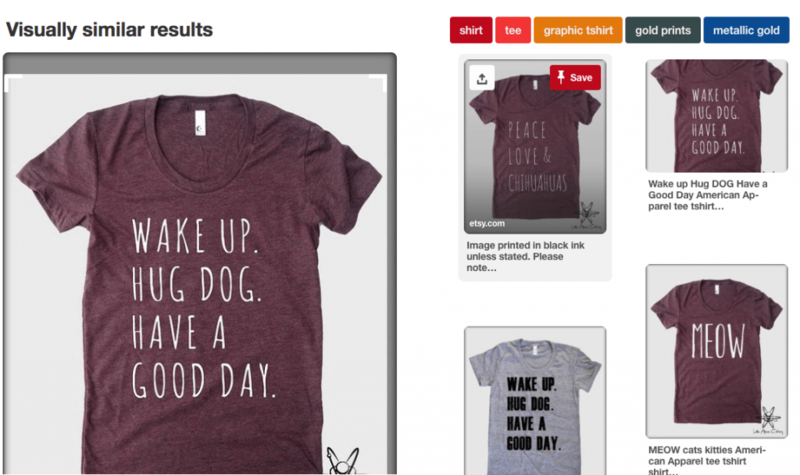 Social Media Marketing Hacks: How Do You Persuade People to Buy T-Shirts? Have You Seen This Crazy Powerful Facebook Targeting Tool?